Bob Mehen checks out this updated version of Hagen's 'heavy horse' external filter. Hagen’s Fluval FX5 has been the 'filter of choice' on many larger tanks since its release in 2005. Few filters can match its huge capacity, impressive flow rates or ease of starting, and as I’ve been running one on my 600 l/132 gal aquarium non-stop for the last five and a half years, I was very interested to get to grips with its replacement, the imaginatively named FX6. At first glance, little obvious has changed externally apart from the colour. Where the FX5 was dressed in charcoal and orange livery, the FX6 has red and black to match the rest of the Fluval external filter range. The same functional, chunky 'bucket with a pump stuck on the bottom' aesthetic remains, with the FX6 squatting under your tank like a smaller, wetter version of R2-D2. Minor design tweaks are noticeable, such as the new lid fastenings, which are now a three-pronged star-shape allowing a better grip for tightening, especially with wet hands. Tiny rebates have been moulded into the lid to make snapping these fastenings into place easier as well. The lid of the filter now carries two impressive looking dials on top, marked one to 12, which had me excited when I first opened the box. Sadly, these are not anything to do with the function of the filter and are simply there as a physical reminder of when the filter was last cleaned and when you last carried out a water change. The other obvious external change is the pump. On the old FX5 it was particularly prominent, making it look like R2-D2 was wearing a bustle or had a nasty hernia. On the FX6, it’s a marginally smaller, more compact bulge. This difference is due to the new, more energy-efficient pump, which at 41w uses 7w less than the one on the FX5. According to the manufacturer’s details, the new pump maintains the same output as the old one at 3,500 lph, but, interestingly, the filter circulation rate (measured on a filter with the same length intake/outlet hoses and no media) is around 7% less of that of the FX5 at 2,130 lph instead of 2,300 lph. I can see no obvious reason for this; however, on my tank, at least there was no noticeable differences in flow or filter efficiency. 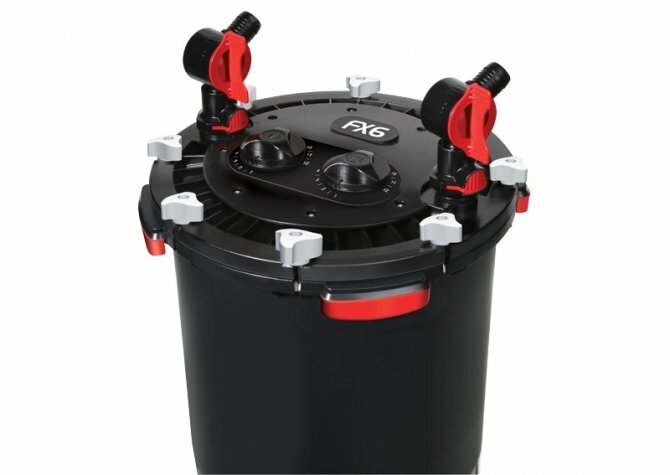 The FX6 also has the same maximum head as its predecessor of 3.3m/11' and identical media capacity of 5.9 l/1 gal, which is predictable as the filter body and baskets are the same. Internally, the only change is with the colour of the media baskets, which are now white instead of black. One of the major joys of the old FX5 was its ease of starting. Where most of the competition requires frenzied pumping at priming mechanisms or the risk of a mouthful of 'Chateau du Poisson' as you desperately try and get them syphoning, the FX6 shares the same effortless start as its ancestor. Simply pour at least 8 l/2 gal of water into the canister, connect the pipework, open the taps, switch on and off it goes. The pump will run for one minute to fill the canister with water and then stop for two to allow air to escape. From then on, it will run continuously until unplugged again, apart from stopping for one minute every 12 hours to release any trapped air (the FX5 stopped for two minutes once every 24 hours). It really is as easy as that. One gripe with the FX5 was the lack of media included; it came with the basic sponges placed around the edge of each of the three media baskets but nothing else. While this allowed fishkeepers to choose media suitable for their own preferences, this was a costly extra, as these filters need plenty of media to fill them up. Hagen has gone some way toward redressing this with the FX6, which comes with a selection of foam, carbon pad, bio-media and media bags — still not enough to fully furnish the belly of this beast, but a step in the right direction. Hagen also now includes a length of hose suitable for use with the 'purge valve' situated at the bottom of the filter. 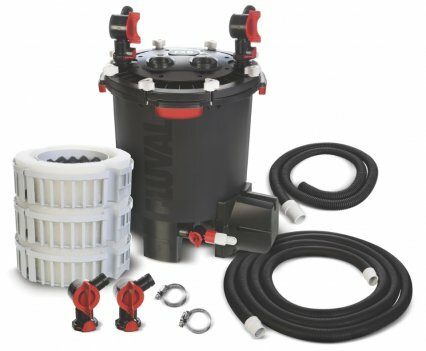 This allows you to remove larger, heavier debris that may sit at the bottom of the filter in situ, as well as draining water from the filter to reduce its weight before moving it. The last change noted is that the pipe for the intake strainer is now telescopic; this is useful, as previously it needed cutting to length, which restricted your choices if you wanted to use the filter on a deeper tank once cut. How do you improve on a well-designed, award-winning filter like the FX5? Well Hagen seems to have taken the 'if it ain’t broke, why fix it?' route and left the changes to the bare minimum. If you have an FX5 already, then I wouldn’t be rushing out for an upgrade, but if you’re in the market for a big, efficient, dependable and easy to use external, then the FX6 is still the one to beat. Price: RRP £299.99 with a three-year warranty (not including wear and tear parts).